In celebration of our rich maritime heritage, the Incorporated Village of Port Jefferson in partnership with the New York Marine Trade Association, presents the 4th Annual Port Jefferson Boater’s Maritime Festival June 6-7, 2015. Port Jefferson, NY - May 13, 2015 - In celebration of our rich maritime heritage, the Incorporated Village of Port Jefferson in partnership with the New York Marine Trade Association, presents the 4th Annual Port Jefferson Boater’s Maritime Festival June 6-7, 2015. The exciting festival will take place throughout the entire Village and to specifically showcase the Port Jefferson Harbor, one of the most popular deep-water harbors on Long Island. Boaters appreciate the prime location with easy access, deep draft local shops, restaurants and entertainment just a short walk from the marina docks. This two- day festival will host the Port Jeff Boat Show with over 50 boats on display and dozens of fishing vendors at one of the island’s only outdoor shows. Sailing demonstrations will take place on the harbor as well as a regatta planned on Sunday at 2pm. Maritime related attractions, museums, and organizations will be present along with FREE open demos of kayaks, inflatable boats and paddleboards. Flyboard Long Island will have extreme water sport demos throughout the day and the Seastreak high speed ferry from Manhattan will debut service to Port Jefferson…hop aboard the boat to take a look at this 149 passenger state-of-the-art vessel. 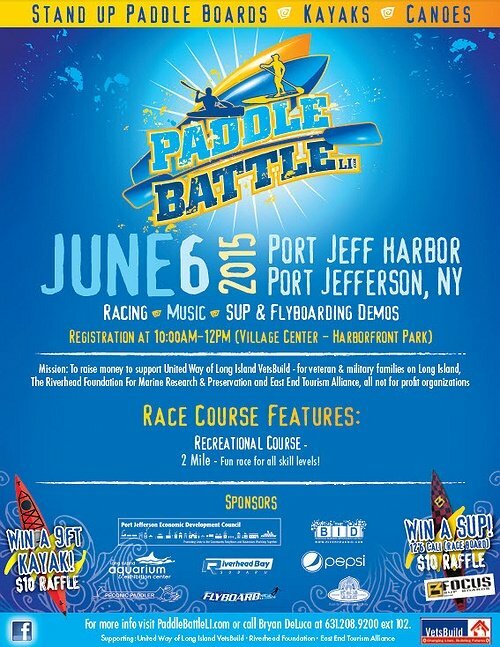 New this year is the addition is the Paddle Battle Long Island Port Jefferson Race on Saturday, June 6th. The 2.5 mile recreational race includes kayak and stand up paddle boards, each in separate categories. This fun filled day of races helps raise money for not-for-profit organizations such as the United Way of Long Island VetsBuild program, the Riverhead Foundation for Marine Research and Preservation and the East End Tourism Alliance. Click here to sign up today. Other festival exhibitors will include the Long Island Maritime Museum, the Maritime Explorium, Riverhead Foundation, Long Island Aquarium and Exhibition Center. The festival features the Greater Port Jefferson Northern Brookhaven Arts Council artists on display, law enforcement vessels in the harbor and walk on tours of the Stony Brook Sea Wolf research boat. Coastal Steward beach cleanup, sailing demos and clam eating contest are among the exciting and interactive events taking place at the Port Jefferson Boater’s Maritime Festival. Food and drink at the Harbor Bistro food court will be offered by local eateries and the Port Jeff Brewery. Live music throughout the festival, pirate shows and treasure hunts will round out the entertainment for the entire family. For more information contact: Jill Russell. Subject: LongIsland.com - Your Name sent you Article details of "4th Annual Port Jefferson Boater's Maritime Festival June 6-7, 2015: Boating & Fishing Show"